Long before the chartered flights that come with life in the NHL, a 14-hour bus ride wouldn't be out of the question for Morgan Rielly. First in Grade 9 when we went away to boarding school in Wilcox, Sask., to pursue his hockey dream, and then in the WHL with the Moose Jaw Warriors. "We drove to Kamloops, B.C., from Wilcox," said Rielly, now a defenceman for the Toronto Maple Leafs. "We drove to Chicago. We drove all over the province of Saskatchewan, from Wilcox to Prince Albert. All winter. And then in junior we're driving all over Western Canada on a bus." 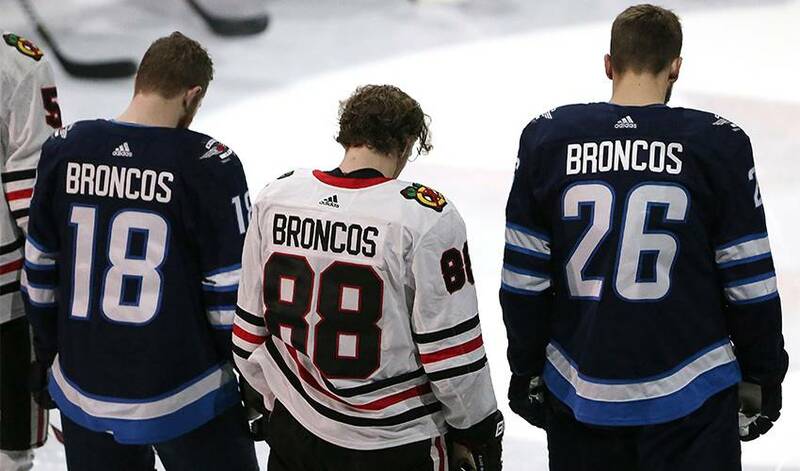 In the wake of Friday's horrific crash involving the Saskatchewan Junior Hockey League's Humboldt Broncos that killed 15 people and injured 14 more, NHLers took time to reflect on the countless bus trips they took to games in their formative years. Bonds that can't be broken were forged on those lonely stretches of highway linking hockey-mad towns and cities across the country. "You really get to know one another, you get to know a lot about yourself," Rielly said Saturday. "You spend time with each other travelling, playing cards, and you learn to enjoy it. "That's just a part of life growing up playing hockey." The Broncos were travelling from Humboldt to take on the Nipawin Hawks in Game 5 of their semifinal series when the crash took place on a stretch of road north of Tisdale. Leafs centre Tyler Bozak, who is from Regina and played junior in B.C., said similar bus rides that crisscross the Canadian landscape are simply a way of life. "You create a lot of memories," he said. "That's where you spend the majority of time with your friends and your teammates. For something like that to happen is just tragic. It's a sad day. "Everyone holds a heavy heart." For Edmonton Oilers captain Connor McDavid, who isn't much older than the members of Humboldt's team, it's hard to comprehend a tragedy of this magnitude. "Unthinkable," he said. "Everyone in hockey knows the time we spend travelling around, especially on buses. Some of my fondest memories in junior came on the bus. "It's a horrible accident and we're all thinking of them." With junior teams at a host of levels dotting all 10 provinces, buses are often the only option. "This was supposed to be as safe as it gets," Leafs head coach Mike Babcock said. "It just goes to show you you've got to embrace each and every day, and every day that you're with your family." Oilers defenceman Ethan Bear said those rides should be one of the best parts of a young hockey player's life. "You're together with the guys for six, five, four hours and you're just kinda having fun, hanging out, making jokes, watching movies," he said. "It's something you don't wish for anybody. It's pretty sad." Montreal Canadiens head coach Claude Julien has taken countless bus rides in a hockey career that stretches back to the 1970. He said there's always the risk of something going terribly wrong. "There's a lot of good stories that have come out of these bus trips," he said. "There's also been some close calls when you're dealing with traffic, when you're dealing with snowstorms. "I stand here right now and I've got shivers going down my body because you can just imagine what everybody's going through." Calgary Flames forward Troy Brouwer remembered one particularly scary experience during his time riding the buses in junior. "We were on our way to Saskatoon for a game for Moose Jaw," he said. "Our bus fishtailed and we ended up half in a ditch. We ended up cancelling the game. We turned around and went home. "I've been on buses in winter conditions on the road and it can be scary." Rielly said swapping stories about long bus rides amounts to a rite passage in the WHL. "Even guys that aren't playing anymore, you still talk about the bus rides," he said. "What movies you watched and what card games you played, and it's memories that won't ever leave you. "When you talk to guys in this room, or on different teams that you might meet along the way, that's the first thing you talk about, 'What was your longest bus ride?'" Troy Brouwer chalks it up to timing for his NHL chance, but it's postseason prowess that's helped him get to 800 regular-season games. The GM of the OHL's Erie Otters offers up why the Connor McDavid, Edmonton Oilers captain and two-time Ted Lindsay Award recipient, is the real deal. As Troy Brouwer recalls, it wasn’t much fun facing the Florida Panthers. He doesn’t have to worry about that now. The NHLPA announced today at the 2018 NHL Awards™ presented by Hulu that Connor McDavid of the Edmonton Oilers is the recipient of the 2017-18 Ted Lindsay Award after garnering the most votes from the players for his exceptional season.